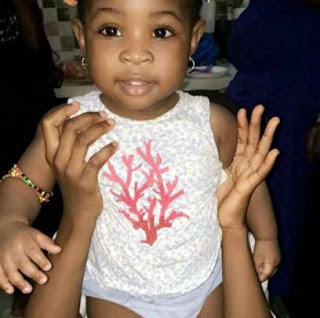 Nigerian singer Davido is having fun with his little girl, Imade this festive season. The singer took to Snapchat on Christmas day sharing various videos of himself and one-year-old Imade on a lunch date. Davido just arrived touring the city of London and he sure did miss that cute smile, baby language and laughter. He also took to SnapChat on December 6, 2016, with the inscription: "I miss my daughter so much!" Just recently, the singer was captured dressing up his little girl who laid innocently on a bed. In the latter part of the video, the Sony Music Entertainment artiste was seen feeding her, but she appeared not to have much of an appetite. The father and daughter moment was extended to the singer's Instagram page where he posted a picture of the both of them with the caption "Twin twin" and a love emoticon.